This Golden-crowned Sparrow got trapped in garden netting. Maybe as he was trying to reach berries or perhaps he had fled into a netting-covered bush to escape a predator. Whatever the cause, he was found on the ground with the netting tightly wrapped around his head and neck. In his struggles to get free, this bird did horrific damage to his neck. You can see the terrible twist in his neck in the video above, taken after initial stabilization in the Wildlife Hospital. The fact that the bird’s neck is injured is obvious, but the exact specific reason he was unable to lift his head was as yet unknown. Upon intake, Medical Staff quickly placed the bird in a dark ICU on oxygen to reduce his stress. Stress is a primary risk factor for adult songbirds in care, and controlling that was the first priority. Once he was stable, he received subcutaneous fluids, pain medications and anti-inflammatories. Radiographs (x-rays) would have to wait until the bird was less stressed, but to prevent further damage and keep the bird comfortable, Medical Staff placed a supportive brace around his neck. In addition, a special cage set-up was necessary to allow the bird to eat. Sparrows usually eat from the ground, but with his neck in a brace, this bird needed a raised feeding platform. Two days later, the sparrow was strong enough for radiographs. The films showed that the bird had not, in fact, broken his neck, but he suffered from nerve, tendon and muscle damage. Fortunately, WildCare’s medical team doesn’t give up on an injured animal that might have a chance to survive! You may remember the pigeon with the broken neck last year who, through a similar course of treatment, made an amazing recovery. Click here to read that bird’s story. 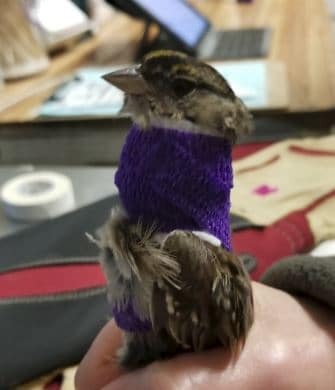 Having had experience with birds with similar injuries, we knew that this sparrow needed supportive care and neck brace changes every other day. Medical Staff also carefully monitored his ability to eat and the stages of his improvement. Even WildCare Medical Staff was impressed when, after just ten days in care, the bird no longer needed the brace (see photo left). After a period of monitoring the bird in a small cage with the brace off, they determined he was ready to move to an outdoor aviary. The sparrow was very weak at first, but he quickly regained his flight skills and endurance. Finally, after 43 days in care, this bird had made a full recovery! He was released back to the wild, fully flighted and brilliantly healthy once more. Watch him fly free in the video below. WildCare gets dozens of wildlife patients every year that have been entangled in garden netting. This plastic mesh is extremely hazardous to wild animals, and we strongly recommend that people not use it. Believe it or not, sheer polyester curtains are actually an effective, reusable and wildlife-safe alternative to garden netting… see an article on using curtains to protect fruit here. 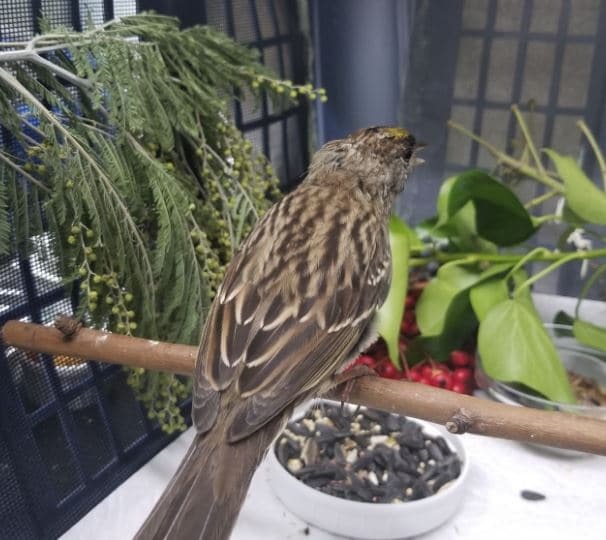 Obviously you should still check covered trees and plants daily for animals like this sparrow that may have gotten themselves trapped underneath, but curtains will protect fruit without causing entanglements. Flash tape and motion-detecting sprinklers are also potentially effective alternatives to garden netting, but perhaps the best solution of all is to plant more and share with your wild neighbors. Help WildCare always be ready to help injured birds like this Golden-crowned Sparrow! Click to donate today! Thank you for helping all the animals! Thank you so much for caring for this precious bird and helping him recover and releasing him in the wild. Makes me worry of all the animals who get hurt in these situations and don’t get rescued. But thank you for caring for those who are lucky to come into your care!